Miracle Fruit plant, Synsepalum dulcificum, is also known as Miracle Berry. Miracle Fruit is a large shrub whose fruit creates miracles in your mouth. Eat the small red fruit and for several hours, after all acid foods, such as lemon, will taste deliciously sweet. 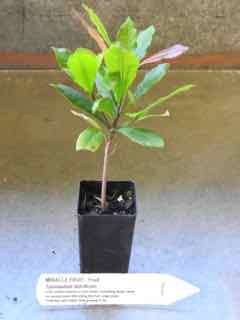 Miracle Fruit plant is native to tropical Africa and prefers rich well-drained soils in a protected, partially shaded position. – enjoys high humidity. Drought and frost tender. A large shrub, growing to 3m. A slow growing plant.